Well, it's that time of year again, my state Guild's annual Quilt Show. I love being a part of this wonderful display, with the yearly trip down to check out all the marvellous quilts on display, catching up with friendly quilters, recognising faces but having a hard time remembering all the names to go along with them! Then there's the shopping and the pauses for coffee. What a great day. And to top it all off and make it a bit more special, this year I took out 2 awards, third place Pictorial Section for "Alexandra's Interlude" and second place Small Quilts Professional for "Rufous Fantail". 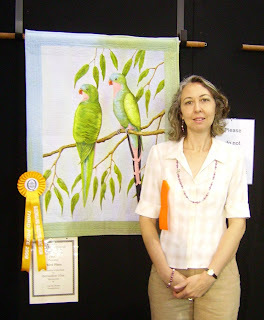 Ros Ward, another talented art quilter and Queenslander (and fellow prize winner) was kind enough to take this pic of me beside my birds. 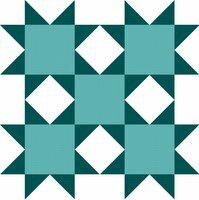 You can see all the winning quilts on the Queensland Quilters website. I won some terrific prizes, kindly donated by Homespun Magazines, Can do Books, Perivale Gutterman and Freudenberg. Thank you to all the sponsors, you help to make it a great show. I'll be on a high for weeks.